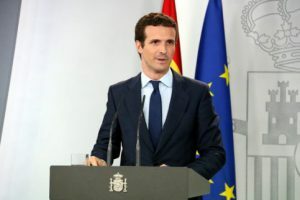 The judge overseeing the case of the Master’s degree of the new People’ Party (PP) leader, Pablo Casado, has called for the Spanish Supreme Court to investigate it. The Supreme Court is the only one that can judge members of the Spanish Congress. 37-year-old Casado had promised ‘regeneration’ when he replaced Mariano Rajoy as leader of the PP on 21 July, following Rajoy’s departure after losing a no-confidence vote called over the corruption scandals affecting the party. Carmen Rodríguez-Medel says she sees evidence of crimes of ‘administrative impropriety and bribes’, regarding Casado getting his diploma in regional law from the Spanish capital’s Rey Juan Carlos University in 2009, without going to lectures or passing exams. Over previous weeks, the judge has spoken to witnesses and other people being investigated. Since collecting the information, she has now asked for the Supreme Court to get involved, as it is beyond her judicial jurisdiction with Casado being a member of Congress. She believes Casado received the Masters as a ‘gift’, one of several to have allegedly benefited from this special favour. Now, the high court will have to ask the prosecutor’s office to position itself in a report on the competence of the Supreme Court and the content of the investigation. Back in April, Casado said that he did the course between 2008 and 2009 without going to class or doing any exams. How? Casado said the director of the Master, Enrique Álvarez Conde, managed to validate him in 18 of the 22 subjects, and he passed the rest by writing four essays. But now, the Rey Juan Carlos University has admitted that they don’t have ‘any document’ to certify that the new PP leader actually did those essays, nor ‘any track record’ to prove that the works were submitted for evaluation. Judge Rodríguez-Medel is the same judge who oversaw the case against the PP’s Cristina Cifuentes. The leader of the Madrid regional government resigned in April after CCTV footage showing her allegedly shoplifting 40 euros worth of cosmetics came to light. Her resignation came a month after a Spanish newspaper disclosed irregularities in her own Master’s degree – and in what became known as “Mastergate”. Subsequent reports put in question whether she had handed in and completed her Master’s thesis, and a certificate that she presented was deemed as fake by the professors who allegedly signed it, as well as by the university rector himself.